Clean, updated, and right on the beach, what more could you ask for!? This interior studio is a perfect option for couples, small families, or a small group of 4. This unit features 1 king bed and 1 queen-sized sleeper sofa. Everything is brand new! As of March 2019, this rental is equipped with new furniture, new flooring, new 55 inch TV, and new accents and decor. This glorified hotel room offers approximately 400 sq. ft. of living space. Inside the condo there is also a kitchen sink, microwave, and mini fridge. Our guests will have access to a private balcony and private bathroom with a tub and shower. 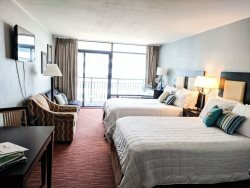 As your host, we also provide all towels, linens, bedding, and starter toiletry items. Being an interior unit, our guests will not have a view of the ocean from their room. Rather, our guests will enjoy what is called a "courtyard" view. The courtyard view overlooks the resort and enclosed pools. Despite not having the best view, our guests love having clean and updated accommodations. This rental is just steps to the ocean, pools, bars, restaurants, and all amenities that the Landmark Resort offers.